For the report, see A Green New Deal. 7.1 Past projects referred to as "Green New Deal"
Throughout the 1970s and 1990s an economic policy to transition the United States economy off of nonrenewable energy which was developed by multiple activists. This approach was subsequently taken up by the Green New Deal Group, which published its eponymous report on July 21, 2008. The concept was further popularized and put on a wider footing when the United Nations Environment Programme (UNEP) began to promote it. In the spring of 2008, author Jeff Biggers launched a series of challenges for a Green New Deal from the perspective of his writings from coal country in Appalachia and the heartland. Biggers wrote, "Obama should shatter these artificial racial boundaries by proposing a New “Green” Deal to revamp the region and bridge a growing chasm between bitterly divided Democrats, and call for an end to mountaintop removal policies that have led to impoverishment and ruin in the coal fields." Biggers followed up with other Green New Deal proposals on various media venues for the next four years. On October 22, 2008 UNEP's Executive Director Achim Steiner unveiled the Global Green New Deal initiative that aims to create jobs in "green" industries, thus boosting the world economy and curbing climate change at the same time. The Green Party of the United States and Green Party presidential candidate Jill Stein proposed a "Green New Deal" beginning in 2012. The Green New Deal remains officially part of the platform of the Green Party of the United States. In 2006 a Green New Deal was created by the Green New Deal Task Force as a transitional plan to an one hundred percent clean, renewable energy by 2030 utilizing a carbon tax, jobs guarantee, free college, single-payer healthcare and a focus on using public programs. Since 2006 the Green New Deal has been included in the platforms of multiple Green party candidates, such as Howie Hawkins gubernatorial campaigns in 2010, 2014, and 2018, and Jill Stein's 2012 and 2016 presidential campaigns. A week after the 2018 midterm elections, climate justice group Sunrise Movement organized a protest in Nancy Pelosi's office calling on Pelosi to support a Green New Deal. On the same day, freshman congresswoman Alexandria Ocasio-Cortez launched a resolution to create a committee on the Green New Deal. Following this, several candidates came out supporting a "Green New Deal", including Deb Haaland, Rashida Tlaib, Ilhan Omar, and Antonio Delgado. They were joined in the following weeks by Reps. John Lewis, Earl Blumenauer, Carolyn Maloney, and José Serrano. Organizations supporting a Green New Deal initiative included 350.org, Greenpeace, Sierra Club, Extinction Rebellion and Friends of the Earth. "Providing all people of the United States with – (i) high-quality health care; (ii) affordable, safe, and adequate housing; (iii) economic security; and (iv) access to clean water, clean air, healthy and affordable food, and nature." "Providing resources, training, and high-quality education, including higher education, to all people of the United States." "Meeting 100 percent of the power demand in the United States through clean, renewable, and zero-emission energy sources." "Repairing and upgrading the infrastructure in the United States, including . . . by eliminating pollution and greenhouse gas emissions as much as technologically feasible." "Building or upgrading to energy-efficient, distributed, and ‘smart’ power grids, and working to ensure affordable access to electricity." "Upgrading all existing buildings in the United States and building new buildings to achieve maximal energy efficiency, water efficiency, safety, affordability, comfort, and durability, including through electrification." "Overhauling transportation systems in the United States to eliminate pollution and greenhouse gas emissions from the transportation sector as much as is technologically feasible, including through investment in – (i) zero-emission vehicle infrastructure and manufacturing; (ii) clean, affordable, and accessible public transportation; and (iii) high-speed rail." "Spurring massive growth in clean manufacturing in the United States and removing pollution and greenhouse gas emissions from manufacturing and industry as much as is technologically feasible." "Working collaboratively with farmers and ranchers in the United States to eliminate pollution and greenhouse gas emissions from the agricultural sector as much as is technologically feasible." 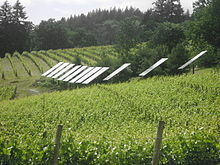 The approach pushes for transitioning the United States to use 100% renewable, zero-emission energy sources, including investment into electric cars and high-speed rail systems, and implementing the "social cost of carbon" that has been part of Obama administration's plans for addressing climate change within 10 years. Besides increasing state-sponsored jobs, this Green New Deal is also aimed to address poverty by aiming much of the improvements in the "frontline and vulnerable communities" which include the poor and disadvantaged people. To gain additional support, the resolution includes calls for universal health care, increased minimum wages, and preventing monopolies. On March 26, in what Democrats called a "stunt," Republicans called for an early vote on the resolution without allowing discussion or expert testimony. In protest, all Democrats voted "present" or against the bill resulting in a 57–0 defeat on the Senate floor. In contrast, Representative Ro Khanna thought that creating a Select Committee specifically dedicated to a Green New Deal would be a "very commonsense idea", based on the recent example of the Select Committee on Energy Independence and Global Warming (2007–2011), which had proven effective in developing a 2009 bill for cap-and-trade legislation. On January 17, 2019, prospective presidential candidate Jay Inslee called for Green New Deal goals of "net-zero carbon pollution by midcentury" and creating "good-paying jobs building a future run on clean energy" in a Washington Post op-ed. However, he framed these efforts in terms of national mobilization, saying "Confronting climate change will require a full-scale mobilization – a national mission that must be led from the White House." An article in The Intercept characterizes a Green New Deal more broadly, as economic planning and industrial policy measures which would enable mobilization for the environment, similar to the economic mobilization for World War II, and similar to the internal planning of large corporations. Economist Stephanie Kelton (a proponent of Modern Monetary Policy) and others  argue that natural resources, including a stable, livable climate, are limited resources, whereas money – following the abandonment of the gold standard – is really just a legal and social tool that should be marshaled to provide for sustainable public policies. To this end, a mix of policies and programs could be adopted, including tax incentives and targeted taxes, reformed construction and zoning standards, transportation fleet electrification, coastal shoreline hardening, Farm Bill subsidies linked to carbon capture and renewables generation, and much more. Practically, Kelton argues that the key to implementation is garnering enough political support, rather than becoming fixated on specific "pay-fors." Many proposed Green New Deal programs would generate significant numbers of new jobs. Many who support some goals of the Green New Deal express doubt about feasibility of one or more parts of it. John P. Holdren, former science advisor to Obama, thinks the 2030 goal is too optimistic, saying that 2045 or 2050 would be more realistic. Many members of the Green party have also attacked the plan due to its cutting of multiple parts of their plan, such as the elimination of nuclear power and jobs guarantee, and the changing of the goal from an one hundred percent clean, renewable energy economy by 2030 to the elimination of the U.S. carbon footprint by 2030. Paul Bledsoe of the Progressive Policy Institute, the think tank affiliated with the conservative Democratic Leadership Council, expressed concern that setting unrealistic "aspirational" goals of 100% renewable energy could undermine "the credibility of the effort" against climate change. When Senator Dianne Feinstein (D-CA) was confronted by youth associated with the Sunrise Movement on why she doesn't support the Green New Deal, she told them "there’s no way to pay for it" and that it could not pass a Republican controlled Senate. In a tweet following the confrontation, Feinstein said that she remains committed "to enact real, meaningful climate change legislation." In February 2019, the centre-right American Action Forum, estimated that the plan could cost between $51–$93 trillion over the next decade. They estimate its potential cost at $600,000 per household. The organization estimated the cost for eliminating carbon emissions from the transportation system at $1.3–2.7 trillion; guaranteeing a job to every American $6.8–44.6 trillion; universal health care estimated close to $36 trillion. According to Bloomberg Businessweek, Wall Street is willing to invest significant resources toward GND programs, but not unless Congress commits to moving it forward. In an op-ed for Slate, Alex Baca criticizes the Green New Deal for failing to address the environmental, economic, and social consequences of urban sprawl. Adam Millsap criticizes the GND's overreliance on public transit to make cities more environmentally friendly, since public transit integrates better in monocentric cities than in polycentric ones. He suggests land use reforms to increase density, congestion pricing, and eliminating parking requirements as measures that can be applied more flexibly to cities with monocentric and polycentric layouts. On February 9, 2019, United States President Donald Trump voiced his opposition using sarcasm via Twitter as follows: "I think it is very important for the Democrats to press forward with their Green New Deal. It would be great for the so-called “Carbon Footprint” to permanently eliminate all Planes, Cars, Cows, Oil, Gas & the Military – even if no other country would do the same. Brilliant!" Democratic Senator Diane Feinstein objected to the plan saying "there's no way to pay for it" and is drafting her own narrowed down version. Democratic Senator Joe Manchin criticized the plan as a "dream" adding that 'it would hurt regions dependent on reliable, affordable energy." Republican White House aide Sebastian Gorka has referred to the deal as "what Stalin dreamed about but never achieved" and that "they [proponents of the deal] want to take your pickup truck. They want to rebuild your home. They want to take away your hamburgers." The comments about hamburgers are a common criticism of the deal by conservatives, who have gone on to criticize Representative Ocasio-Cortez for allowing her Chief of Staff to eat a hamburger with her at a Washington restaurant. On March 14, 2019, Rep. Rob Bishop, a Republican representing Utah's 1st congressional district, said that the legislation was "tantamount to genocide," adding shortly afterward that his comment was "maybe an overstatement, but not by a lot." The Australian Greens have advocated for a "Green Plan", similar to the Green New Deal, since 2009. Deputy Leader Christine Milne discussed the idea on the ABC's panel discussion program Q&A on February 19, 2009, and it was the subject of a major national conference of the Australian Greens in 2009. In March 2019 a group of activists called on Labour to commit to taking radical steps to decarbonise the UK economy within a decade. A group spokesperson said they are calling the proposed movement "Labour for a Green New Deal" because, "Climate change is fundamentally about class, because it means chaos for the many while the few profit." They are calling for expansion of public ownership and democratic control of industry, a region-specific guarantee of green jobs, and substantial investments in public infrastructure. The group states that they got their inspiration from the Sunrise Movement and the work that congresswoman Alexandria Ocasio-Cortez has done in the US. Group members have met with Zack Exley, co-founder of the progressive group Justice Democrats, to learn from the experiences that he and Ocasio-Cortez have had in working for the Green New Deal campaign in the US. ^ Whyte, Chelsea (February 12, 2019). "Green New Deal proposal includes free higher education and fair pay". NewScientist. Retrieved March 4, 2019. ^ Meyer, Robinson. "The Green New Deal Hits Its First Major Snag". The Atlantic. Retrieved January 31, 2019. There’s not a single, official Green New Deal. Much like “Medicare for All,” “Green New Deal” refers more to a few shared goals than to a completed legislative package. (The original New Deal basically worked the same way.) Now a number of environmental groups are trying to make those goals more specific. But they’re running into a snag: The bogeymen that haunted old progressive climate policies are suddenly back again. And the fights aren’t just about nuclear power. ^ a b Harder, Amy (December 13, 2019). "Why Al Gore is on board with the Green New Deal". Axios. Archived from the original on December 14, 2018. Retrieved December 13, 2018. ^ a b c "Sorry Democrats, the Green Party Came Up With the Green New Deal!". ^ A Green New Deal: Discursive Review and Appraisal. Social Science Research Network (SSRN). Notes on the 21st Century. Accessed March 14, 2019. ^ Hilary French, Michael Renner and Gary Gardner: Toward a Transatlantic Green New Deal Archived March 29, 2014, at the Wayback Machine The authors state: "Support is growing around the world for an integrated response to the current economic and environmental crises, increasingly referred to as the "Green New Deal". The term is a modern-day variation of the U.S. New Deal, an ambitious effort launched by President Franklin Roosevelt to lift the United States out of the Great Depression. The New Deal of that era entailed a strong government role in economic planning and a series of stimulus packages launched between 1933 and 1938 that created jobs through ambitious governmental programs, including the construction of roads, trails, dams, and schools. Today's Green New Deal proposals are also premised on the importance of decisive governmental action, but incorporate policies to respond to pressing environmental challenges through a new paradigm of sustainable economic progress." ^ Rebecca Shabad; Dartunorro Clark (March 26, 2019). "Senate fails to advance Green New Deal as Democrats protest McConnell 'sham vote'". NBC News. Retrieved April 4, 2019. The measure, which needed 60 votes to clear a procedural hurdle, failed in a 0-57 vote, with 43 Democrats voting present. ^ "Where are the Greens in the Green New Deal?". ^ Kaufman, Alexander C (June 30, 2018). "What's the 'Green New Deal'? The surprising origins behind a progressive rallying cry". Grist. Archived from the original on November 13, 2018. Retrieved November 13, 2018. ^ a b Friedman, Thomas L. (January 19, 2007). "Opinion – A Warning From the Garden". The New York Times. ^ Friedersdorf, Conor (May 21, 2012). "The 3 Green Party Candidates and Their Disappointing Platforms". The Atlantic. Archived from the original on November 15, 2018. Retrieved November 14, 2018. Jill Stein's "Green New Deal" is far and away the most deeply thought-out platform on offer, and it still consists largely of assertions of the utopian ends it'll achieve, rather than realistic means for getting there. ^ "Green New Deal: Organizer, Physician Jill Stein Poised to Win Green Party's Presidential Nomination". ^ "Give us a mandate for what America needs: a Green New Deal". ^ "Green New Deal". GPUS. Archived from the original on November 17, 2018. Retrieved November 17, 2018. ^ a b c d "The Democrats Stole the Green Party's Best Idea". ^ a b "The 'Green New Deal' isn't really that new". ^ Kaufman, Alexander C. (November 7, 2018). 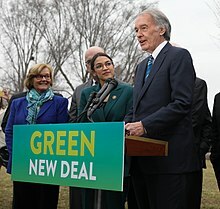 "Democrats' Green New Deal Wing Takes Shape Amid Wave Of Progressive Climate Hawk Wins". Huffington Post. Archived from the original on November 13, 2018. Retrieved November 13, 2018. ^ Carlock, Greg; McElwee, Sean. "Why the Best New Deal Is a Green New Deal". The Nation. ISSN 0027-8378. Archived from the original on November 13, 2018. Retrieved November 13, 2018. ^ Kahn, Brian. "Most Americans Think We Can Save the Planet and Create Jobs at the Same Time". Earther. Archived from the original on November 13, 2018. Retrieved November 13, 2018. ^ "Green New Deal Report". Data For Progress. Retrieved November 13, 2018. ^ a b Read, Bridget (November 2, 2018). "Watch Bria Vinaite Explain the Green New Deal". Vogue. Archived from the original on November 13, 2018. Retrieved November 13, 2018. ^ Roberts, David (November 15, 2018). "Alexandria Ocasio-Cortez is already pressuring Nancy Pelosi on climate change". Vox. Archived from the original on November 28, 2018. Retrieved December 2, 2018. ^ Corbett, Jessica (November 7, 2018). "Saving Planet With 'Green New Deal' Proves Popular as Climate Hawks Celebrate Midterm Victories". Common Dreams. Archived from the original on November 13, 2018. Retrieved November 13, 2018. ^ Burke, Michael (November 18, 2018). "John Lewis joins Ocasio-Cortez on climate change push". TheHill. Archived from the original on November 21, 2018. Retrieved December 8, 2018. ^ Germanos, Andrea (November 30, 2018). "As Number of Dems Backing Green New Deal Swells to 18, Campaigners Demand All of Party 'Stand Up to Fossil Fuel Billionaires'". Common Dreams. Archived from the original on December 2, 2018. Retrieved December 2, 2018. ^ Gamboa, Suzanne (November 30, 2018). "Ocasio-Cortez, diverse lawmakers prioritize climate change with 'Green New Deal'". NBC News. Archived from the original on December 2, 2018. Retrieved December 2, 2018. ^ Klein, Naomi (November 27, 2018). "The Game-Changing Promise of a Green New Deal". The Intercept. Archived from the original on November 27, 2018. Retrieved December 8, 2018. ^ a b Willis, Jay (December 6, 2018). "How Alexandria Ocasio-Cortez's "Green New Deal" Might Help Save the Planet". GQ. Archived from the original on December 7, 2018. Retrieved December 8, 2018. ^ a b c d Homan, Timothy R. (November 24, 2018). "Five things to know about Ocasio-Cortez's 'Green New Deal'". TheHill. Archived from the original on November 26, 2018. Retrieved December 2, 2018. ^ a b Golden, Hannah. "The Green New Deal Is Challenging This Old Myth About Fighting Climate Change". Elite Daily. Archived from the original on December 8, 2018. Retrieved December 8, 2018. ^ Colón, Christina (December 10, 2018). "Nearly 150 Climate Activists Arrested in Mass Demonstration for Green New Deal". Sojourners. Archived from the original on December 17, 2018. Retrieved December 16, 2018. ^ "Climate protest at Pelosi's office spurs arrests". Euronews. December 11, 2018. Archived from the original on December 17, 2018. Retrieved December 16, 2018. ^ Keck, Catie. "Earther – Hundreds of Local and State Officials Just Endorsed Alexandria Ocasio-Cortez's Green New Deal". Gizmodo. Archived from the original on December 16, 2018. Retrieved December 16, 2018. ^ "At COP24 Climate Talks in Katowice, 300+ Elected Officials from 40 States Call for Phasing Out Fossil Fuels, Green New Deal Approach". Elected Officials to Protect America. December 14, 2018. Archived from the original on December 17, 2018. Retrieved December 16, 2018. ^ Gustafson, Abel (December 14, 2018). "The Green New Deal has Strong Bipartisan Support". Yale Program on Climate Change Communication. Archived from the original on December 18, 2018. Retrieved December 18, 2018. ^ Rizzo, Salvador (February 11, 2019). "Fact Checker: What's actually in the 'Green New Deal' from Democrats?". Washington Post. Retrieved March 2, 2019. As a reader service, we’re going to summarize what’s actually in the Green New Deal from Democrats, and how we ended up with all this confusion. ^ "Resolution: Recognizing the duty of the Federal Government to create a Green New Deal" (PDF). United States House of Representatives. February 7, 2019. Retrieved February 7, 2019. ^ Meyer, Robinson (March 26, 2019). "The 3 Democrats Who Voted Against the Green New Deal". The Atlantic. Retrieved March 28, 2019. The Senate rejected the Green New Deal on Tuesday, in a decisive 57–0 vote that Democrats decried as a political stunt meant to divide their caucus. All the Republican senators opposed the measure. They were joined by four senators who caucus with the Democrats – Senator Joe Manchin, from the coal-heavy state of West Virginia, along with Senators Kyrsten Sinema of Arizona, Doug Jones of Alabama, and Angus King of Maine. ^ a b Cama, Timothy (November 30, 2018). "Dems rally for Green New Deal". TheHill. Archived from the original on December 1, 2018. Retrieved December 2, 2018. ^ Cama, Timothy (January 2, 2019). "House Dems formalize climate committee plans without Green New Deal language". TheHill. Retrieved January 19, 2019. ^ Meyer, Robinson (December 28, 2018). "Democrats Establish a New House 'Climate Crisis' Committee". The Atlantic. Retrieved January 19, 2019. ^ a b "Climate change: Meet the Florida congresswoman leading the House charge". USA Today. Retrieved January 19, 2019. ^ Gonyea, Don (December 30, 2018). "House Democrats Form New 'Climate Crisis' Committee". National Public Radio. Retrieved January 19, 2019. ^ a b c Meyer, Robinson (January 18, 2019). "The Green New Deal Hits Its First Major Snag". The Atlantic. Retrieved January 19, 2019. ^ a b Kahn, Brian. "More Than 600 Environmental Groups Just Backed Ocasio-Cortez's Green New Deal". Earther. Retrieved January 19, 2019. ^ Atkin, Emily (January 15, 2019). "Some of the Biggest Green Groups Have Cold Feet Over the "Green New Deal"". The New Republic. ISSN 0028-6583. Retrieved January 19, 2019. ^ a b Temple, James. "Let's keep the Green New Deal grounded in science". MIT Technology Review. Retrieved January 19, 2019. ^ Geman, Ben (January 10, 2019). "Environmental groups pressure House for "visionary" measures to support the Green New Deal". Axios. Retrieved January 19, 2019. ^ Mali, Meghashyam (December 7, 2018). "Overnight Energy: Schumer demands climate measures in infrastructure bill | OPEC, Russia to cut oil output | EPA looks to ease Obama water rule". The Hill. Archived from the original on December 8, 2018. Retrieved December 8, 2018. ^ Levitz, Eric. "Schumer to Trump: Give Us Green Infrastructure, or We'll Give You None". New York Magazine – Intellegencer. Archived from the original on December 9, 2018. ^ Inslee, Jay (January 17, 2019). "The next president must make climate change the top priority". Washington Post. Retrieved January 19, 2018. ^ Aronoff, Kate (December 5, 2018). "With a Green New Deal, Here's What the World Could Look Like for the Next Generation". The Intercept. Archived from the original on December 5, 2018. Retrieved December 8, 2018. ^ a b Kelton, Stephanie; Bernal, Andres; Carlock, Greg (November 30, 2018). "We Can Pay For A Green New Deal" – via Huff Post. ^ Brown, Ellen (January 25, 2019). "The Financial Secret Behind Germany's Green Energy Revolution". Common Dreams. Retrieved January 27, 2019. ^ Siegel, Josh (January 24, 2019). "Greens want 2020 Democrats to go beyond vague 'Green New Deal' support". Washington Examiner. Retrieved January 27, 2019. ^ Cohen, Steve (January 14, 2019). "The Politics of a Green New Deal". State of the Planet. The Earth Institute, Columbia University. Retrieved January 27, 2019. ^ Dembicki, Geoff; Cheadle, Harry (December 7, 2018). "The Left Thinks a 'Green New Deal' Could Save Earth and Destroy the GOP". Vice. Archived from the original on December 8, 2018. Retrieved December 8, 2018. ^ a b Lavelle, Marianne (January 3, 2019). "New Congress Members See Climate Solutions and Jobs in a Green New Deal". InsideClimate News. Retrieved January 19, 2019. ^ a b c Grunwald, Michael. "The Trouble With the 'Green New Deal'". Ppolitico Magazine. Retrieved January 19, 2019. ^ Schallhorn, Kaitlyn (January 11, 2019). "What is the Green New Deal? A look at the economic and climate concept pushed by progressives". Fox News. Retrieved January 19, 2019. ^ Friedman, Lisa; Gabriel, Trip (February 21, 2019). "A New Deal at Once Possible and Problematic". The New York Times. p. A1. Retrieved March 11, 2019. Holdren, who is now a professor of environmental policy at Harvard University, said the Green New Deal’s timeline of achieving that goal around 2030 is not feasible. “As a technologist studying this problem for 50 years, I don’t think we can do it,” he said. “There’s hope we could do it by 2045 or 2050 if we get going now,” he added. ^ Beckett, Lois (February 23, 2019). "'You didn't vote for me': Senator Dianne Feinstein responds to young green activists". The Guardian. Retrieved February 24, 2019. ^ Natter, Ari (February 25, 2019). "Alexandria Ocasio-Cortez's Green New Deal Could Cost $93 Trillion, Group Says". Bloomberg. Retrieved March 2, 2019. The so-called Green New Deal may tally between $51 trillion and $93 trillion over 10-years, concludes American Action Forum, which is run by Douglas Holtz-Eakin, who directed the non-partisan CBO from 2003 to 2005. That includes between $8.3 trillion and $12.3 trillion to meet the plan’s call to eliminate carbon emissions from the power and transportation sectors and between $42.8 trillion and $80.6 trillion for its economic agenda including providing jobs and health care for all. ^ Henney, Megan (February 26, 2019). "Alexandria Ocasio-Cortez's Green New Deal could cost $93 trillion, group says". FoxBusiness. Retrieved February 26, 2019. ^ "The Green New Deal: Scope, Scale, and Implications". AAF. Retrieved February 26, 2019. ^ Dmietrieva, Katia (February 14, 2019). "Wall Street Is More Than Willing to Fund the Green New Deal". Bloomberg Businessweek. Retrieved March 11, 2019. The plan’s greatest flaw, critics say, is that it would be too costly. Ocasio-Cortez advocates deficit spending, and she’s floated a 70 percent marginal tax rate for high earners that would generate some of the necessary revenue. But those worried about where the rest of the money will come from are forgetting one major, surprisingly enthusiastic player: Wall Street. ^ "AFL-CIO criticizes Green New Deal, calling it 'not achievable or realistic'". Washington Post. March 12, 2019. Retrieved March 12, 2019. ^ Baca, Alex (February 7, 2019). "The Green New Deal's Huge Flaw". Slate. Retrieved March 29, 2019. ^ Millsap, Adam A. (February 9, 2019). "Green New Deal's Plan For Planes, Trains, And Automobiles Won't Work". Forbes. Retrieved March 29, 2019. ^ "Green New Deal FAQ | Representative Alexandria Ocasio-Cortez". archive.org. February 7, 2019. Retrieved February 14, 2019. ^ Stein, Jeff; Weigel, David (February 11, 2019). "Ocasio-Cortez retracts erroneous information about Green New Deal backed by 2020 Democratic candidates". The Washington Post. Retrieved February 21, 2019. ^ Kaufman, Alexander C. (January 25, 2019). "Former U.N. leader Ban Ki-moon just endorsed Democrats' fight for a Green New Deal". Grist. Retrieved January 27, 2019. ^ Santus, Rex (February 7, 2019). "AOC's Green New Deal has the backing of every major 2020 candidate". Vice. Retrieved February 8, 2019. ^ Teirstein, Zoya (January 25, 2019). "Kirsten Gillibrand doesn't just support the 'idea' of a Green New Deal, she's wholly behind it". Grist. Retrieved January 27, 2019. ^ "A Green New Deal". Retrieved April 13, 2019. ^ Burke, Michael (January 25, 2019). "Kamala Harris endorses Ocasio-Cortez's 'Green New Deal'". The Hill. Retrieved February 8, 2019. ^ Henderson, Bruce (December 11, 2018). "Rep. Kennedy announces support for the Green New Deal". Village 14. Retrieved January 11, 2019. ^ LaChance, Naomi (November 30, 2018). "Naomi Klein on the Urgency of a 'Green New Deal' for Everyone". Truthdig: Expert Reporting, Current News, Provocative Columnists. Archived from the original on December 3, 2018. Retrieved December 2, 2018. ^ Evans, Greg (February 1, 2019). "Bill Maher Sees "Glimmer Of Hope" For Climate Change: Americans Less Stupid". Deadline. Retrieved February 21, 2019. ^ "Sign the petition: support a Green New Deal for America and our planet". www.jeffmerkley.com. Retrieved February 27, 2019. ^ Schlanger, Zoë. "Ocasio-Cortez's climate plan is the only one that matches scientific consensus on the environment". Quartz. Archived from the original on July 1, 2018. Retrieved July 3, 2018. ^ "Dems rally for Green New Deal". November 30, 2018. Archived from the original on December 1, 2018. Retrieved November 30, 2018. ^ "Elizabeth Warren backs the "idea" of a Green New Deal". Axios. Archived from the original on January 2, 2019. Retrieved January 2, 2019. ^ Wyden, Ron (January 10, 2019). "It's Time for a 'Green New Deal'". Politico. Retrieved January 19, 2019. ^ Yang, Andrew (January 9, 2019). "Aligned and on board". Twitter. Retrieved February 20, 2019. ^ "Europe now has a Green New Deal and it's coming to a ballot box near you in May". ^ "Search". Retrieved December 1, 2018. ^ "Search". Archived from the original on November 17, 2018. Retrieved November 17, 2018. ^ "Protests for Social Justice: A Green New Deal for Israel?". boell.de. Heinrich Böll Foundation. Archived from the original on June 26, 2015. Retrieved October 12, 2016. ^ "Green New Deal in Ukraine? The Energy Sector and modernizing a National Economy". boell.de. Heinrich Böll Foundation. Archived from the original on July 4, 2018. Retrieved October 12, 2016. ^ "Search". neweconomics.org. Archived from the original on December 8, 2015. Retrieved October 12, 2016. ^ "How are we doing on a 'Green New Deal?'". Open Democracy. October 7, 2018. Archived from the original on November 13, 2018. Retrieved November 13, 2018. ^ "in 1 minuten". Global Marshall Plan (in German). Retrieved January 3, 2019. ^ Trump, Donald (February 2019). "US Presidential Twitter Feed". Twitter.com. Archived from the original on February 9, 2019. Retrieved February 9, 2019. ^ King, Ledyard. "Biggest obstacle to passage of Green New Deal? Democratic lawmakers". USA Today. Retrieved March 16, 2019. ^ "'They want to take away your hamburgers'". March 1, 2019. Retrieved March 2, 2019. ^ Walker, Rep Mark (February 13, 2019). "After the success of the Fyre Festival, we bring you the Green New Deal. #GNDisFyrepic.twitter.com/uNzT42ZbNV". @RepMarkWalker. Retrieved February 14, 2019. ^ Shaw, Adam (February 13, 2019). "Green New Deal mocked in Fyre Festival parody, as GOP turns plan into punching bag". Fox News. Retrieved February 14, 2019. ^ Harvey, Chloe (April 27, 2009). "The green plan that will save our skins" (PDF). Green Magazine. Retrieved March 27, 2019. ^ "Episodes – Q&A". Retrieved March 27, 2019. ^ Singleton-Norton, Lefa (December 7, 2009). "Editorial" (PDF). Green Magazine. Retrieved March 27, 2019. Past projects referred to as "Green New Deal"
Text of H. Res. 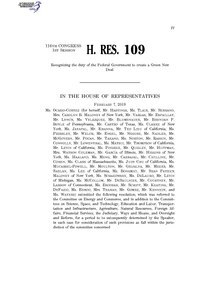 109: "Recognizing the duty of the Federal Government to create a Green New Deal." Introduced February 7, 2019.